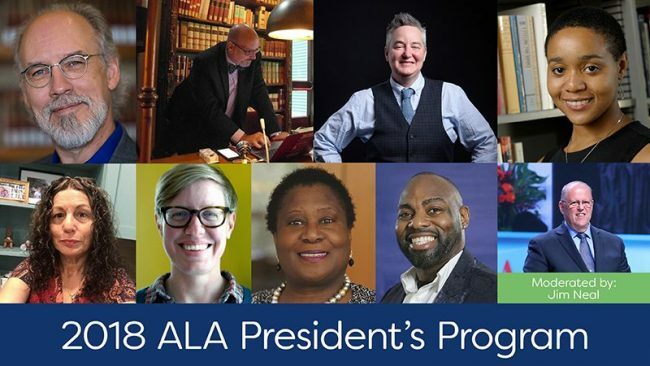 Speakers at the American Library Association President's Program, clockwise from top left: James LaRue, R. David Lankes, Chris Bourg, Emily Knox, ALA President Jim Neal, Kelvin Watson, Em Claire Knowles, Emily Drabinski, and Kathleen de la Peña McCook. 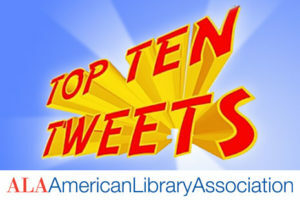 “Are libraries neutral? Have they ever been? 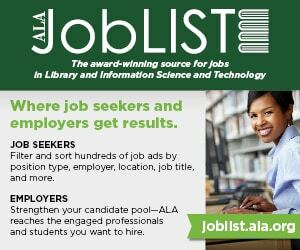 Should they be?” asked American Library Association (ALA) President Jim Neal during his President’s Program at the ALA Midwinter Meeting & Exhibits in Denver February 11. The program featured a sprawling discussion in which multiple definitions of neutrality were proposed, and various positions were argued for and against them. The rhetoric was lively and occasionally prickly on the stage, in the audience, and on social media. Arguing in favor of neutrality were Em Claire Knowles, assistant dean for student and alumni affairs at Simmons School of Library and Information Science in Boston, and James LaRue, director of ALA’s Office for Intellectual Freedom. Arguing against were Chris Bourg, director of libraries at Massachusetts Institute of Technology, and R. David Lankes, director of the University of South Carolina’s School of Library and Information Science in Columbia. In addition to the debaters, a second panel—including Emily Drabinski, coordinator of library instruction at Long Island University in Brooklyn; Kathleen de la Peña McCook, professor at University of South Florida School of Information in Tampa; Emily Knox, assistant professor at University of Illinois at Urbana-Champaign School of Information Sciences; and Kelvin Watson, director of Broward County (Fla.) Libraries Division—provided commentary. All eight panelists then responded to audience questions. LaRue began by stating, “Neutrality does not mean librarians have no values—we do.” He defined neutrality as not denying access to library services and resources, and not seeking to silence people on the basis of their backgrounds or beliefs. He used the legal definition of libraries as “content neutral”—courts have ruled that the mission of libraries is to provide a neutral platform that treats everyone the same, but made a clear distinction between speech and ideas, which are protected, and behavior, which is not. “Can librarians punch Nazis because of what they believe?” he asked. “Then we deny them the common legacy of humanity—the right to be really wrong in public.” He warned that the arguments to challenge privilege will often be used to defend it. Bourg, the first speaker against the idea of library neutrality, argued that the very idea of the library as a social institution that provides community resources is not neutral. A library represents a decision on how a community spends resources. What resources, how much funding, and even the location of the library are not neutral decisions, she said. 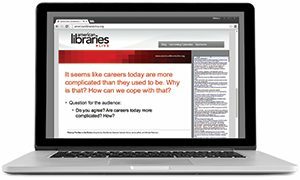 Librarianship as a profession is 85% white, and Bourg argued there is nothing neutral about a profession being stubbornly white despite changing national demographics. Knowles said she believes that intellectual freedom can only be achieved by a commitment to neutrality. She described a process of active commitment, which must be regularly renewed and reimagined; passive neutrality is not adequate to meet challenges of racist or sexist speech. She emphasized having strong policies that allowed equal access to materials, meeting space, and services. Balanced collections policies may prevent challenges to materials. “Libraries must be safe, responsible spaces for diverging opinions,” she said. 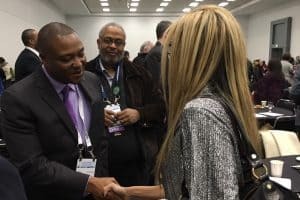 “I think an active, engaged, reaffirmed neutrality is the first rung on the ladder to advocacy and social justice,” she concluded. Librarians cannot be passionate advocates for communities and still claim to be neutral, said Lankes. For example, equity is not a neutral position. “If we do not address inequities, we are not neutral—we are harmful and instruments of oppression,” he said. Libraries are grounded in communities not for efficiency but for effectiveness, and communities themselves are not neutral, he said. Some communities use content filters to reduce police surveillance and thus improve access and privacy, for example. The four commentators were then given 10 minutes each to respond. Drabinski pointed out that discussions of neutrality usually take place in a theoretical realm far from the material reality of library work and limited resources. A choice for one thing in a library is inherently a choice against something else. “We buy one book to the exclusion of thousands of others, and in the process, we make our libraries one kind of world,” she said. Knox said her opinion kept going back and forth with each speaker’s points. “I agreed with everything, actually, because I think this is really about a definition for neutrality.” Her primary area of research is intellectual freedom and censorship, and saying censorship is wrong is not a neutral position. Knox tells her students to think about policies and the disparate impact they can have. Neutrality is a decision and means taking a stand: Should libraries support black people? Should they support Black Lives Matter? Does not supporting it mean the library is neutral? Not supporting Black Lives Matter is not neutral—it is a decision. Is it less controversial? For whom? Does your library have a Black History Month display? Then your library has already decided that black lives matter, she said. “Black Lives Matter is not controversial in my family. It is probably controversial in many of your families,” Knox said. If libraries take people seriously, they must take people’s lives seriously, even when their lives are controversial. McCook brought a book for each of the speakers and explained her reasons for each selection. Her parents didn’t finish high school, so she says they were afraid to go into their public library—they would drop her off outside. She reminded attendees that class issues and politics are often highly divisive. As an example, she explained that a contractor who recently came to her house was dismayed by political signs in her yard that he disagreed with, so she tried to engage him by asking if he went to the library. He said he wouldn’t go to the local public library and used the library at his church instead. Watson declared that neutrality is a non-stance, allowing information professionals to avoid accountability by abdicating ethical responsibility. Librarians can’t be neutral on social issues that impact their customers because those issues impact librarians as well. “Claiming neutrality endangers us as an institution,” he said. The full taped discussion will be available on the Midwinter scheduler in 4–6 weeks.